The first person to tell me that I resembled the honourable member for Islington North was my creative partner of many years, Paul Smith. (Paul was always quick to spot things.) Next to mention it was Martin Morris, an art tutor who actually lives in Jeremy Corbyn’s constituency and has met him, so probably knows what he looks like. Farther from home, I have received several messages containing the unwanted information that I am a dead spit for the man that Labour have elected to help them lose the next election. In terms of miles, the farthest distance travelled bearing this unwelcome observation came in the form of an email from David Horry who lives in Shanghai. Quick on the heels of Horry, Pete Matthews had the barefaced cheek to post a picture of me next to one of Jeremy Corbyn on my Facebook timeline. This has earned one notable ‘like’ from Tim Lindsay, no less, the chief executive officer at D&AD. None of this is funny, I can tell you. However, if you look closely at the pictures above you will discover a great difference between them. I am sitting on the aft deck of a yacht, sunning myself in the sunshine off the Cote d’Azur, having just enjoyed a fine lunch washed down by a chilled bottle of Domaines Ott at Club 55 in Ramatuelle. Jeremy looks like he just got out of bed on a cloudy day in Islington and couldn’t find his comb. Or at least, couldn’t be arsed to look for it. Similarly, on Facebook, Jeremy looks more like the man from Del Monte than a man from Monte Carlo. These aren’t the only differences, either. I am a capitalist lackey who has spent his entire career writing advertising on behalf of large, international corporations, most of whom are headquartered in that land of mammon, the United States – except for Nestlé, of course, who are based in Vevey in Switzerland, the country to which many of the riches of this sceptered isle would most likely flee if Jeremy were ever to become prime minister. Jeremy, on the other hand, is a dyed-in-the-wool socialist who allegedly, according to the Daily telegraph, shagged Diane Abbott – something I have never done. The closest I ever came to an Abbott was David Abbott, and that was on an advertising awards jury. Things finally came to a head a week or so ago. There I was, walking along Hackney’s Mare Street minding my own business, when an athletic looking black man came sprinting out of Wetherspoons and told me that I looked like the newly elected Labour leader. (I have to admit, he did seem slightly drunk, despite the fact this was before noon.) Moments later a pretty young woman asked if she might take a selfie with me to send to her mum. I quickly disabused her of the notion that I was the leader of the opposition and she sloped off. 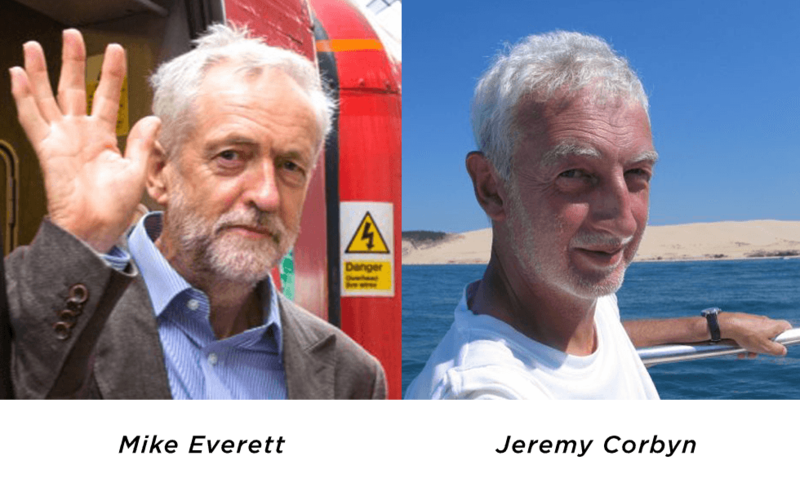 Since my mistaken brushes with fame, two more people have put forward the opinion that I am Jeremy’s doppelganger. One was David Woolfson, a musician friend of mine who I bumped into in Upper Street on Friday. (I hope to Hell he doesn’t write a song on the subject.) The other was Adrian Holmes, a fellow copywriter, who phoned me later the same day with the news that he’d also noticed the resemblance. Luckily, there’s little chance that Adrian will write an ad about it, let alone a song. I have to say that I don’t wish Jeremy Corbyn any ill, but I wish he hadn’t become quite so famous. A part of me hopes that he will soon be usurped as Labour leader, return to his obscure existence on the backbenches, and take his wretched resemblance to me along with him. But that would be unfair to him. No, on second thoughts, I hope he hangs on to the job as long as possible, not least because I am seriously considering signing up to a lookalike agency and I don’t want my new career to be over before it’s even begun. In this role, I might take up a suggestion put to me by my wife: “why don’t you pose for a picture holding a placard that reads ‘Vote Conservative’ ”. Now that would be funny.